I love breakfast, but I am not at all an early morning big breakfast eater. If I make a big breakfast-y meal, it's usually for dinner or for brunch on a special occasion. For our Davidson's Safest Choice Eggs challenge, I decided to make this really fun brunch dish. 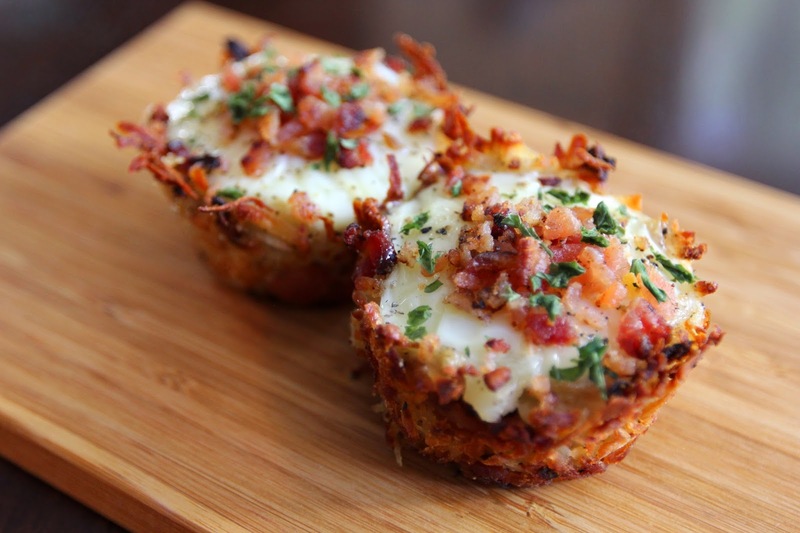 It's eggs, hash browns and bacon all wrapped up in one cute little package! I served these along with some homemade banana bread. I gotta say, I had some very happy guys in my house. Be sure to give yourself plenty of time to get your potatoes baked and cooled before you dive into making this (I baked mine the day before and put them in the fridge overnight.) Since I only made 12 of these, I had some leftover potato mixture. I think it'll make some great potato pancakes! a toothpick. Let cool at least long enough to be able to handle safely. Peel potatoes and grate. Place grated potato into a large bowl. Cook the diced bacon until almost, but not quite, crispy. Spoon on to a paper towel-lined plate and let drain. Discard most of the bacon fat and saute onion in the same hot pan for a couple of minutes. Add the bacon (be sure to reserve some of the bacon if you would like to garnish the tops of your nests before serving), onion, 1 teaspoon of ground pepper and 1/2 teaspoon salt to the potatoes. Toss together until mixed well. Preheat oven to 425°F. Spray a muffin pan generously with non-stick cooking spray. Place about 3-4 heaping Tablespoons of the potato mixture into each cup, and then make a hole by gently distributing potatoes around the bottom and up the sides. Potatoes will shrink while baking, so don't be afraid to let potatoes spill out over the top some. Spray potatoes very lightly with more non-stick cooking spray. Bake for 20-30 minutes, but start checking them at 20. You want them to turn a nice golden brown. Remove from oven and let cool for a few minutes (leave in muffin pan) and keep oven on at 425°F. Crack an egg into each potato cup, being careful not to break the yolk. Sprinkle tops with salt and pepper and place back into oven for about 10-15 minutes, until whites are set. Carefully remove from muffin cups using a fork and a spoon. Garnish with extra crumbled bacon and parsley if desired. Enjoy! What a great idea. I wonder if it would be safe to prebake the potatoes the night before to cut down in prep time? Anyway, thanks for sharing the recipe! Buck, I think that's a great idea! If you do it, will you please let me know how it works out? Thanks!